Meet The expanded Olivants, on the day Dianne and I were married. I was 26 back then, Dianne 24 and the day was simply amazing. This is one of the best picture I have of the four of us, a day I know we all shared the exhilaration of the event, and for Dianne and I the relief that it all came together and we were finally on our voyage called life. Sitting here today I look at my mother and father and wonder what was going through their minds. Dad and I had talked the night before and I know her was truly happy. Dianne and my father had got along almost from the first time they met. She is one of the most honest and straightforward people you will ever meet and that was what my father liked in people. That evening when I got home, but was far too wired to sleep, he told me how pleased he was for us and how well he though our relationship had matured. Dad was not one for emotional chat, but that night I could feel the emotion in his words. Mother was up for the event, one of those days where any mother gets to be proud, and I know she had wanted this for her only child. I look that thier faces in this picture, almost 40 years after one I posted previously. Mother was 65 and dad a month shy of his 64th birthaday. What I would give to go back to that day and talk to each of them with the knowledge and appreciation I have now. How I would life to know what they realy felt that day. I will always be so greatful to them for getting me to that point in life. Damn, we look so young. 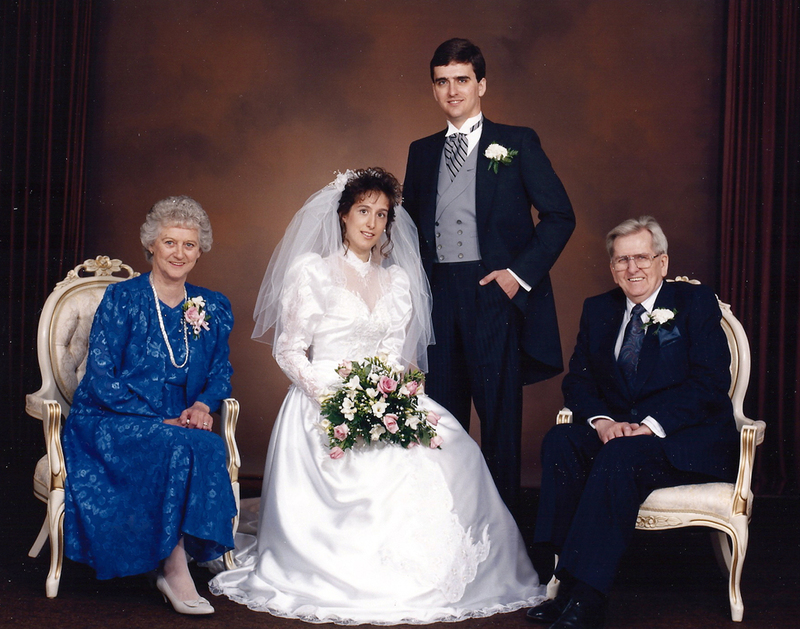 This entry was posted in 1990's, Bea Olivant, Dianne Major-Olivant, Gordon Olivant, Harold Olivant, Weddings and tagged Beatrice Olivant, Dianne Major-Olivant, Gordon Olivant, Harold Olivant.